We finished up my art studio a few days ago. Woohoo! 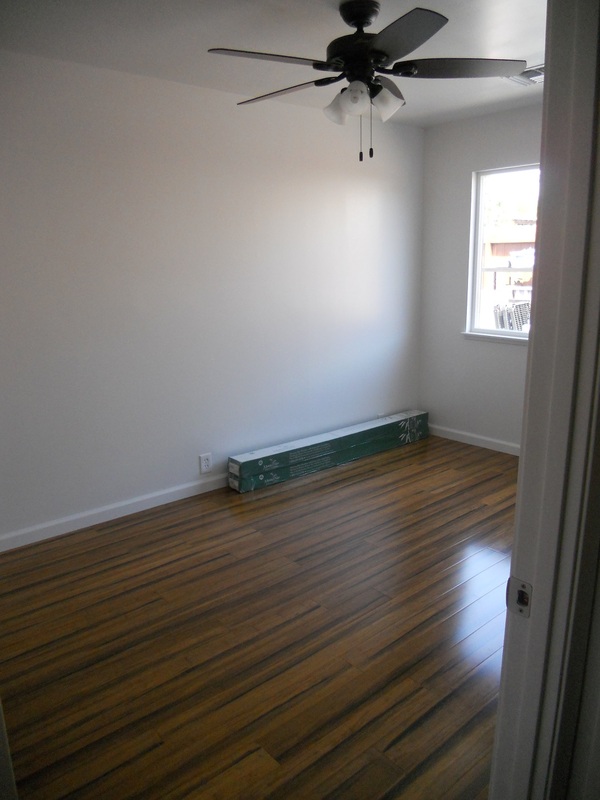 The bamboo flooring install was quite an involved project. Took my husband and I three hours to prep and eight to put it in. What a lesson in teamwork! Trim, ceiling fan, closet doors, and outlet covers were added and the room’s officially finished. Do you have any tips or suggestions on organization? I’d love to hear them as I set up my space. Linking up with Thankful Thursday. This entry was posted in Artist's Studio, Family, Our House and tagged a space of my own, art studio, artist, bamboo flooring, boxes of fabric, empty the room, finished room, installing wood flooring, move-in ready, organization tips, studio move-in, teamwork, Thankful Thursday, wall of shelves on April 16, 2015 by quiltartbymegan.